Toffee is a popular confection made from sugar and butter. It is pleasant creamy with a nice melting texture that can either be soft or hard, depending on how it is prepared. Often spiced up with flavourings like chocolate, nuts and even whisky, toffee is an easy to make and utterly delicious confection. Here’s a basic British toffee recipe you can quickly whip up and enjoy at home. 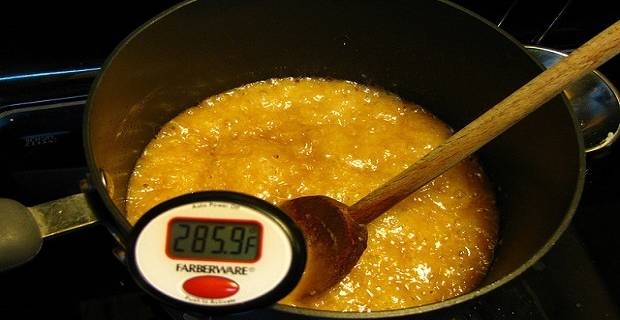 A basic British toffee recipe involves heating a mixture of butter, sugar and water in a saucepan to either the ‘hard crack’ stage (a temperature of 149-154C) or ‘soft crack’ stage (a temperature of 132-143C). If you want to make soft toffee, heat to the ‘soft crack’ stage. If you want to make hard toffee, heat to the ‘hard crack’ stage. Use a deep-sided saucepan when melting butter and sugar because the mixture tends to double in volume during preparation. Pour the toffee on a non-stick backing sheet or greased baking paper, which are easier to peel from the cooled, hardened toffee. Score the slab of toffee while it is cooling to break apart uniform toffee shapes when hardened. 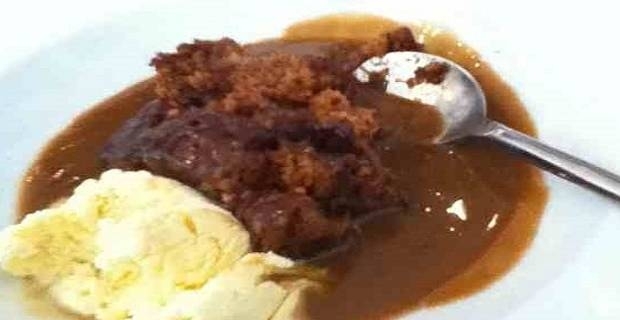 Otherwise, just use a toffee hammer to break the toffee. Add butter, sugar and water in a deep-sided saucepan and heat gently, while stirring until dissolved. Bring to a boil, stop stirring and then reduce the heat and simmer until mixture changes colour. For chewy toffee, remove mixture when it becomes light golden brown. For brittle toffee, remove the mixture when it turns dark golden brown. For hard toffee remove the mixture when it turns a deep golden brown. Pour out the mixture onto a non-stick baking sheet and spread with a spatula or pour the toffee into patty cake papers and allow to set. For best results with a basic toffee recipe, use a sugar to water mixture ratio of 3 to 1. For example, for every three cups of sugar, add one cup of water. You may double or triple the toffee ingredients as desired as long as you maintain the 3:1 ratio. Remember, different toffee recipes, mixtures and temperatures will give different results in terms of flavour, texture and stickiness.